The Blackhawks' Patrick Kane on the ice in 2012. 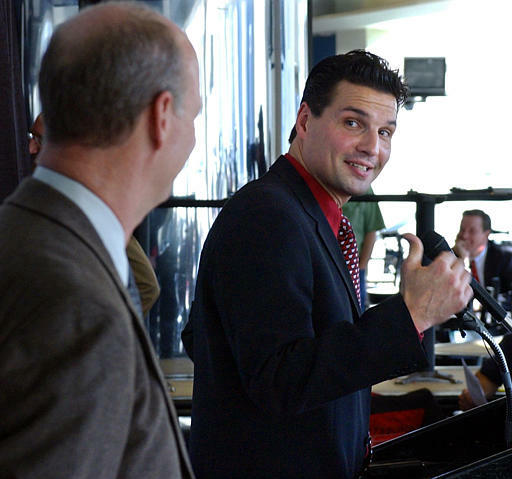 Former Blackhawks great Eddie Olczyk during his tenure as Pittsburgh Penguins coach in 2003. 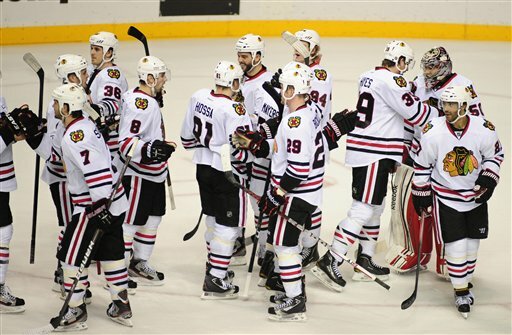 Last weekend the Chicago Blackhawks feted fans with a convention at the Hilton Chicago Hotel, hoping to stir up buzz before they hit the ice, open up training camp and launch into the season — that is, if the season opens without a hitch. But for fans, labor issues were not of concern at the convention. They’re just hoping their team can find a way to advance beyond the first round of the playoffs. That’s been a problem the last two years (of course the ‘Hawks were Stanley Cup winners just three years ago). A couple of other stories took center stage this weekend, most notably Patrick Kane’s. The Blackhawks star made his first public statement since several pictures documenting his unflattering drinking escapades in Madison, Wis., were posted to Deadspin. A contrite Kane talked told the media, “The disappointment from the ‘Hawks organization, my family and to me — it’s embarrassing.” He vowed to be careful with social media moving forward. “You have to realize you’re in the spotlight no matter where you are,” said Kane. He downplayed the notion that he had a drinking problem when that question was raised. And, for the first time since his horrible concussion from a Raffi Torres hit, Marian Hossa addressed the media. He is progressing with his recovery, but has not returned to the ice. Hossa said he is biking, lifting and doing some cardio to begin his training for the season. “The way I feel right now, I believe I&apos;ll be ready for the camp," Hossa said. He spent a lot of his time this summer resting as he recuperated from his head injury. Olczyk was the Blackhawks first round draft choice in 1984 (3rd overall). He played 16 years in the league with six different teams, and won the Stanley Cup with the New York Rangers in 1994. After his playing career, he was the head coach of the Pittsburgh Penguins for two seasons. Now Olczyk is the lead analyst for the NHL national broadcasts, and of course, he handles that role locally for the Blackhawks. Olczyk was humble this weekend about the outpouring of support from his former teammates and the many NHL organizations he was involved with over the years. He doesn’t have to choose one team to represent him in the Hall of Fame. However, if he had to, he said, it would be the Blackhawks. The date of the induction will be determined at a later time.